12V, 3/8", M-Force Driver Drill Kit, 2 Piece D-31 Motor With Dual Ball Bearings For Longer Motor Life, All MetalGear Transmission Creates EfficientP ower, Shift Lock Drive System Instantly Shifts From Drill To Driver Mode, 2.6AH Nickel Metal Hydride Batteries Outlast Any NI-CD Batteries, Locking Ratcheting Chuck Securely Grips All Bits, Includes 2 Batteries, Multi-Voltage Charger, Keyless Chuck, Tool Case. I already have this drill set. I ordered another one this week. My first set is working fine, except one of the batteries won't hold or take a charge. So I went online to get a battery and they are $55. I can get the whole set with 2 batteries, another charger and a new drill for $129. Doesn't make much sense to replace one battery under those circumstances. So now I will have a spare drill, two chargers and three batteries. As for the drill, it is rock-solid. It is easy to use and I haven't found anything it can't handle. I recommend it. But keep in mind if you have a battery die on you, it is just cheaper in the long run to buy a new drill. After going through two Ryobi drills it was finally time for to get something different. I love this drill. It's light enough for me to handle but with enough power for me to be able to accomplish most of the projects around the house. Purchased the whole drill with 2 batteries, charger, case for just a little more than I could buy 2 batteries for my old Makita. These batteries work in my old drill so now I have 2 drills, two chargers, two batteries. What a deal! "A drill for all hands?" I purchased this drill kit well over two years ago and have used it frequently. In all basic functions, it has performed quite nicely amd with no malfunctions. The batteries have exhibited a long run time and give the drill enough power to drill holes and drive screws without complaint. Recharging has been trouble free and after the passage of time, the batteries still appear "fresh" in usage. My complaint? I wish Makita would have thought a bit more about the basic shape of the batteries. If an individual attempting to remove the battery has a fairly large hand and a good grip, removal is not going to be difficult. However, if your hands are smaller and you perhaps suffer from a bit of arthritis, you will in all probablity have trouble getting your thumb and fingers around the wide battery casing and then be able to apply enough inward pressure to depress the built in tabs and pull downward releasing the battery from the drill. Other than this and a "one size fits all" case which is large enough to contain the drill, charger, extra battery with enough space left to include several atticles of clothing should you want to use it as an overnight piece of luggage, it is indeed a quaility tool. I would however, recommend to those who suffer from the limitations mentioned to consider this drill kit only it you can actually see and handle it first to make certain that you can perform the battery removal procedure without difficulty. On delivery I checked the tool for run out at the chuck and found that it wobbled. I made the check based on another review. It could be due to a defective chuck or gear box output shaft run out. The tool is well featured and those features are easy to use. All that though is background noise if the tool can't perform the basic functions of drilling a round hole or driving a screw straight. Those functions cannot be performed with a chuck that wobbles for whatever reason. This was the best purchase I have made in a long, long time. I have had two other brands of cordless drills in the past, and they were never ready to go when I needed them for my crafting or light household projects. This Makita is great because it holds it's charge forever, and if the battery does go down it only takes an hour to charge it !!! I'm pleased with this drill. I bought one seven years ago, and have used it for remodeling projects as well as odds and ends from decking to installing steps on trees for bowhunting. When one battery failed on me, I started shopping, and noted that one person bought more than one kit since the bulk of the cost is for the batteries. It's nice having two drills for a job so I don't have to switch bits and drills. Product was here on time and undamaged. I'm pleased. 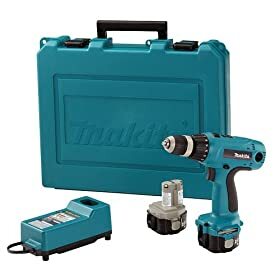 This is a nice drill kit and the drill works fine; I have always liked the Makita tools I bought. But I really bought the kit for the batteries and new charger. The batteries on my 6 year old Makita impact-driver finally died and the economics of replacement batteries is absurd. It only cost nine dollars more to buy the kit with a new drill than to buy just two new batteries alone - and you really need two at a time. Makita, DeWalt, Amazon, anybody - are you listening? Ordered the drill and received about a week later. In brand new condition. This was all after I had attempted to purchase just one battery for 93.50 at a local Lowe's store and would have taken about 2 weeks to get. Have charged up both batteries and used the new drill motor to make sure everything works. Everything works as advertised!! This is the second cordless drill I've owned, and it's very impressive. I particularly like that it slows down immediately upon releasing the trigger and that it sits upright on its battery pack base. I was aware before I bought it that Makita is one of the top brands of power tools, and I can see why - first class all the way (although I would prefer for it to be held securely in place in the case). I would recommend it with no reservations. I've had mine for 7 years now. I just put it on ebay, having just bought a new Ryobi 18V lithium kit. When I first bought it, I was getting into woodworking, and a cordless drill is indisposable in woodworking. I was convinced I would wear out a consumer grade tool. Well, I used the HELL out of this little Makita. It never missed a beat. 12V is enough for 90% of what I did. The only thing that made it balk was drilling inch-and-a-half holes in oak with a spade bit. Spade bits are actually made for high speed, and at high speed, this 12V drill just didn't have the guts. Some of the big, long lag screws als slowed it down, even in the slow range. But now there are cordless impact drivers for that kind of stuff. For drilling holes in wood & steel, driving screws and about 90% of the other household & woodworking stuff, this little drill is all you need. Going with a higher voltage usually just gets you more weight and costs more money. Some people who are looking for this will be upgrading from the low-end Ryobi stuff or even (gasp) Black & Decker or Skil. This is a clear step up. You can feel the quality everywhere. From the user-changable motor brushes to the top-notch trigger switch, to the perfectly fitting hard case to the switch-mode charger. They didn't pull any punches. If you can remember to put the battery on the charger an hour prior to doing the job, you will be extremely happy with this kit. I can't remember to do that though. 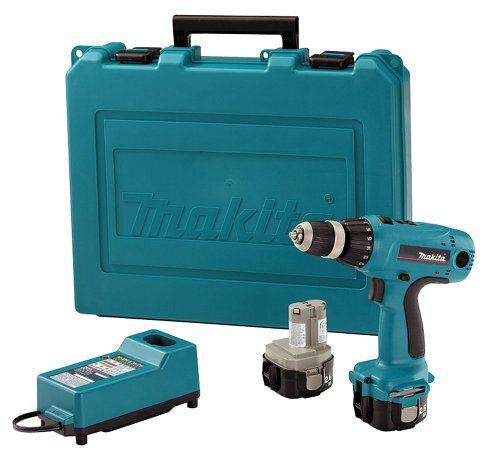 Plain and simple, for a cordless drill, Makita is the brand to use. This is my 3rd over the years and it was the batteries that gave out before the drill. No complaints with Makita or Amazon! Ordered and received with no problems.